As a southerner, I grew up spending vast amounts of time in and around swimming pools. I spent entire seasons in swimming pools. In the summertime my bathing suit was a uniform and chlorine my scent of choice. Pools in the southern summer were a place of respite from the merciless dragon Heat that triumphed and reigned in all spaces sans AC. These limpid wells gently rocked with the promises of relief and weightlessness and endless entertainment for a child's eternity. They were lackadaisical nannies with jostling bosoms, luxury vehicles that entertained a cool tin of high pitched white noise beneath a pristine surface. Anyone who actually had a pool in their backyard seemed a different breed of human, the fence of their backyard being the border to a foreign country. As children, we speculated how different their lives must be with a swimming pool ever awaiting even the whispering of a whim to swim, and endlessly we plotted how to sneak in at the rumour that said neighbor had plans to leave town. In our plans we were scantily clad little immigrants, hopping borders under cover of the thick hot pink haze of dusk to our watery paradise, our imagined imminent freedom. J. Bennett Fitts' "No Lifeguard On Duty" investigates the notion of swimming pool as the quintessential symbol of the American Dream. The swimming pool has become an emblem of the dream itself; as it graces the manicured lawn, the house with the white picket fence, and the big shiny car, it exudes a wavy facade of ease and comfort as the flag of success and the trophy of prosperity. Yet Fitts' photographs are not about ease or the trappings of success. 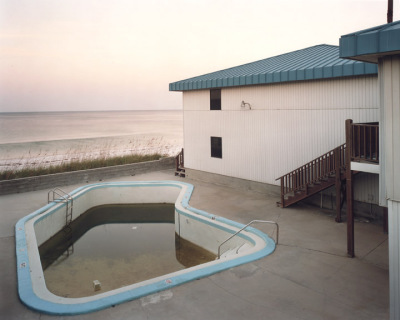 All but one of his photographs depict empty pools in what seem like almost abandoned former homes and old motels. They sit like fallow symbols of what poet Langston Hughes referred to as a "dream deferred". Emtpy and decaying, they are evidence of hope abandoned: heartache in white concrete. 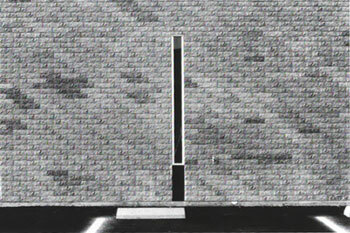 Fitts' photographs call to mind many other artists who have chosen to poetically investigate the tropes of suburbia and the symbols of its landscape, namely Joe Deal, Joel Sternfeld, Lewis Baltz. Yet these photographers are much more observers of the present whose pictures subtly urge the imagination into a stark threat of a looming future. Fitts' photographs differ in that they deal with time that has already passed; they are rife with the pathos of deserted dreams, and an achy nostalgia permeates even the most minimal image. are both evident in Fitts' compositions. Yet, "No Lifeguard On Duty" reeks with the aftermath of apocalypse. Fitts' recording of it serves us in the importance of its continuity. 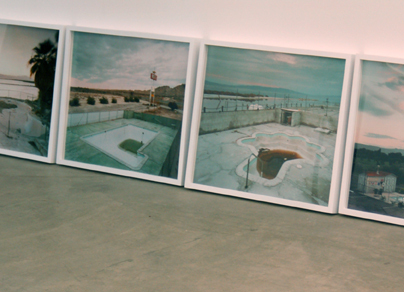 "Grand Junction" is the only photograph in which the pool is full of water. 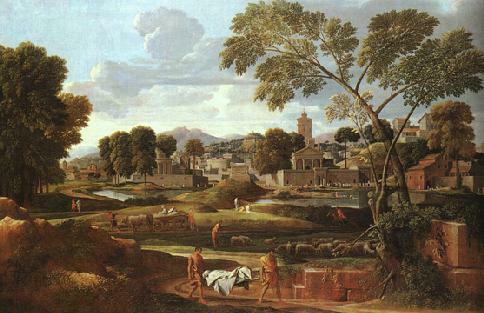 A woman bathes her feet at its edge, and Fitts lets us feel exactly how empty the other pools are; the symbol of prosperity survives even its own plentiful demise, living on timelessly.